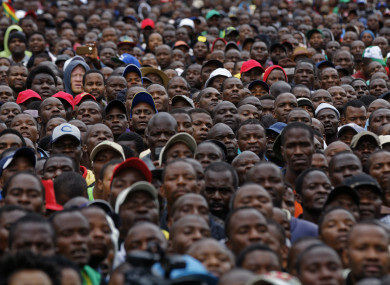 Protesters gather at a demonstration of tens of thousands at Zimbabwe Grounds in Harare, Zimbabwe. THOUSANDS OF PROTESTERS have flooded Zimbabwe’s streets demanding Robert Mugabe’s resignation in a movement organised by independence war veterans and backed by ruling party barons and the army. Veterans of the liberation war, who previously supported Mugabe, had called the gathering which saw marchers rallying in Highfield, a working-class suburb of Harare. “This is the best day of my life. We are hoping for a new life after Mugabe,” said 38-year-old Sam Sechete who was marching at Highfield with a crutch. Shortly after 10.30am Irish time, demonstrators began heading towards Mugabe’s opulent private residence, known as the Blue Roof. In the second city Bulawayo, demonstrators sounded car horns, whistled and blew vuvuzelas as they gathered outside City Hall. But in a statement released yesterday, the army said it fully supported the protests. The majority of Zimbabweans have only known life under Mugabe’s rule which has been defined by violent suppression, economic collapse and international isolation. “I went to university but here I am selling bananas to earn a living. If it wasn’t for Mugabe, I would be doing something else,” said street vendor Abel Kapodogo, 34. This is our new independence day. By 11am, as many as 10,000 people were at the Highfield protest, AFP correspondents said. A separate #ThisFlag march led by anti-Mugabe pastor Evan Mawarire was heading through Harare city centre towards the president’s office at State House. Mugabe enraged many Zimbabweans when he failed to resign following talks with the army’s top brass on Thursday, with sources suggesting the veteran leader was “buying time” to negotiate a favourable end to his 37-year reign. He appeared publicly for the first time yesterday at a pre-planned graduation ceremony in Harare, further stoking speculation about his talks with General Constantino Chiwenga, who led the military power grab. Later yesterday, eight of the 10 regional branches of Mugabe’s ruling ZANU-PF took to state television to call for him to go – yet another a serious blow to the embattled leader. We want to restore our pride and (Saturday) is the day… we can finish the job which the army started. Email “Thousands of protesters turn out in Zimbabwe calling for resignation of Robert Mugabe”. Feedback on “Thousands of protesters turn out in Zimbabwe calling for resignation of Robert Mugabe”.